Best Performing VHF/UHF digital/HD antenna on the market today! "The HD Stacker performed better than all antennas tested even those over twice its size. In the field and on the controlled test range the HD Stacker performed phenomenally well"
(area needed surrounding mast pipe to turn antenna 360 degrees) 70"
Optimized for HDTV/digital TV reception. More powerful than antennas twice its size. Unique "Stacked" design offers increased signal capture area in a much shorter more compact antenna. Great for outdoor or attic installations. Tuned resonance screen reduces size and yet delivers more gain on all UHF channel frequencies. 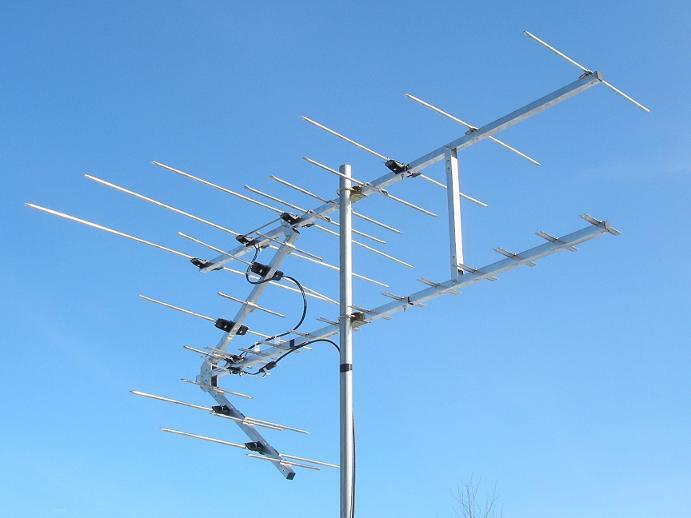 Stacked VHF elements are tuned to provide outstanding VHF signal gain. Very low wind load and rugged design for years of use. Super strong, lightweight aluminum construction. Ultra efficient UHF director elements specifically design for digital signal frequencies provide more signal gathering power per inch of antenna boom. Built with "old fasioned" made in the USA quality. The picture above is a display of several of the antennas tested and is NOT how the antennas were actually set up to be tested. During the test each antenna was placed individually onto the same mast pipe at the same location and tested under the same conditions to help insure accurate results. TEST LOCATION: 3758 W. Washington Rd. Ithaca, Mi. 48847. TEST SPECIFICS. Each antenna was installed at an elevation of 10 feet above ground level. A total of 18 TV channels were tested. A rotor was used to turn and precisely aim each antenna to obtain the best possible signal strength from each of the 18 channels. Fifty feet of RG 6 solid copper coax cable was ran directly from the antenna to a Winegard RC1010 HD digital set top tuner. No signal amplifier was in use (except when testing the Lava antenna with its the built-in signal amplifier). Below are the results of the test. In the column under each antenna listed in the grid is the best signal strength percentage that could be obtained by that antenna on the channel number listed in red to the left. At the bottom of the grid is the average percentage of all 18 channels combined for each antenna tested. The higher the average percentage the better the overall performance of the antenna. The RF channel number indicates the actual broadcast channel frequency used by the TV station to broadcast the signal. NOTE: Signal meters of various tuner brands are calibrated differently and the signal strength percentages will vary from tuner to tuner even though the actual incoming signal strength coming into the tuner remains the same. The same Winegard tuner was utilized for each antenna in this test insuring uniform and fair results. 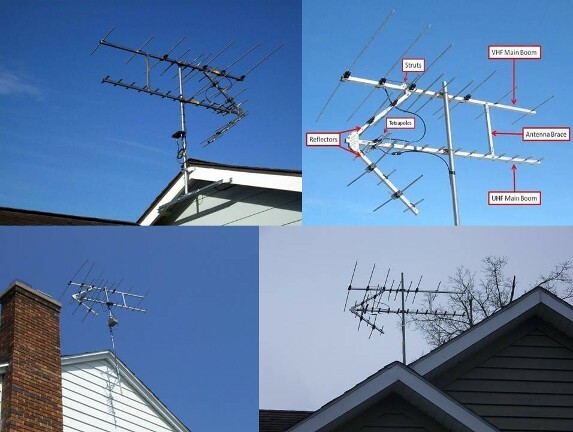 19 TV antennas were tested the top 10 are listed below.